Nigerians believe a lot in living a healthy life by consuming edible leaves with health benefits. 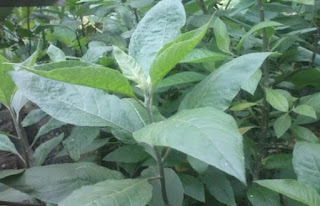 Bitter leaf is an example of an edible leaf that is highly cherished an appreciated in this part of the country. Everybody loves the "bitter leaf soup" in Nigeria, because of the belief that it must have some medicinal value to our health as a result of its bitter taste. The bitter leaf soup have various names it is been called here in Nigeria, according to the different dialects found here. It is called "Onugbu" by the Igbos, "Shiwaka" by the Hausas and "Ewuro" by the Yorubas. Igbo, Hausa and Yoruba are the three major ethnic groups found in Nigeria, that is the more reason why i do make reference of them more often in my posts. Although the bitter leaf plant with the botanical name Vernomia amygdalina have been in existence for ages, only very few people (especially Africans) are aware of its medical and healing properties. The bitter leaf is capable of growing in any where they are found compared to some other types of leaves that only grow in certain places and temperatures. The leaf always flourish in anywhere they grow and they also add beauty to anywhere they grow. The distinctive characteristics of this plant as a whole is its bitter taste. Every part of the plan have a bitter taste, starting from the roots to its leaves. Actually, the bitterness of this plant contribute immensely to its health benefits to the human body. It is very useful to the vital organs of the body, especially the liver and kidney. What Are The Benefits Of Bitter Leaf To The Liver? The liver, for sure is one of the most important organs in the body because it plays a major role that determines the normal functioning of the whole system of the body. Without the liver, all the major process of the body will be altered and eventually terminated. There are functions that the liver need to carry out on a daily basis, which includes the production of bile acids which helps in ft metabolism. Without the liver, it would be impossible for fats to be digested in the body, to release energy. Bitter leaf is highly potent in maintaining the liver's optimum health, in order to release bile acids every time we eat fat-containing foods. Hence, since bitter leaf maintains the health of the liver, it would be advisable to always eat it, so as to live a healthy life. Another vital organ found in the body is the kidney. The function of the kidney is the excretion of waste products (urea) from the body. If there is a malfunction of the kidney, then there is a tendency that the owner of such kidney is in great danger, because there will be accumulation of urea in the body system. Bitter leaf is a natural herb that is very potent in taking care of the kidney. Diabetic patients are also advised to include bitter leaf in their diet because it tends to lower the blood sugar level. Bitter leaf does not only lower the blood sugar level, it also repairs impaired pancreas. An impaired pancreas is incapable of releasing the right amount of insulin that is required to maintain a normal blood sugar level. To conclude this review of this wonder working herb, let us take some list of some general benefits of bitter leaf for our healthy living. It have the capability of healing skin rash, eczema, ring worms and any superficial skin ailment. Note, it should not be applied on an open wound. In conclusion, just one cup of bitter leaf juice can offer a lot of energy your body needs for the day. Now you have the knowledge of some important health benefits of Bitter leaf i guess it wil increase your love it. Don't just learn this alone, kindly share this post with your friends on Facebook and Twitter, you can simply use the social share icon below to achieve that. Thanks! Is 'bitter leaf' the same as moringa? Or neem?